Although London and the South-east of England are suffering from a drought, with low rainfall over the past 18 months and bans on the use of hose-pipes coming in, I started March photographing in the rain on Oxford St, though it did clear up a little later. It was only light rain that day, but since then most days I’ve been out taking pictures it’s also rained, enough to make photography a little tricky on a couple of occasions. 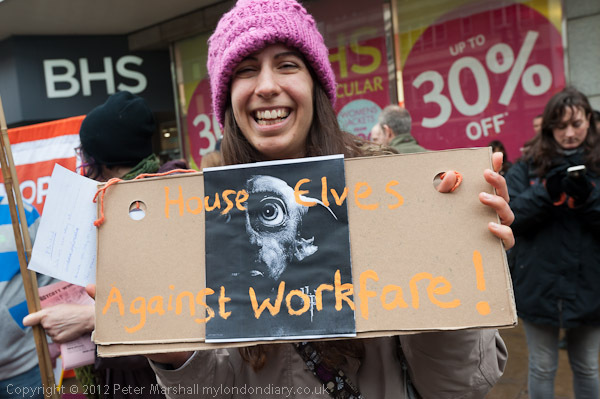 I was on Oxford St to photograph a protest against the government’s workfare scheme, which involves those out of work being forced to take unpaid jobs, supposedly to get experience of work, with major employers who have elected to be a part of the scheme, in order to retain their benefits. 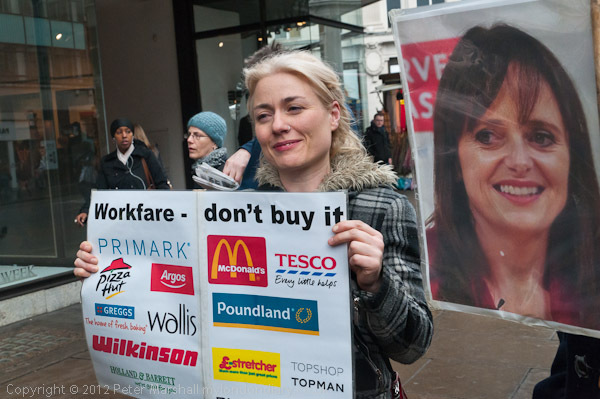 The companies involved get workers for nothing, and the benefits amount to around £1.78 an hour compared to a national minimum wage of just over £6. If the workers were really being trained it might be an acceptable scheme, but in most cases they are simply being used for unskilled work, replacing paid workers. Not surprisingly it has been labelled ‘slave labour’ by many. For once this is an issue where protests have clearly been effective, with quite a few companies actually withdrawing from the scheme. 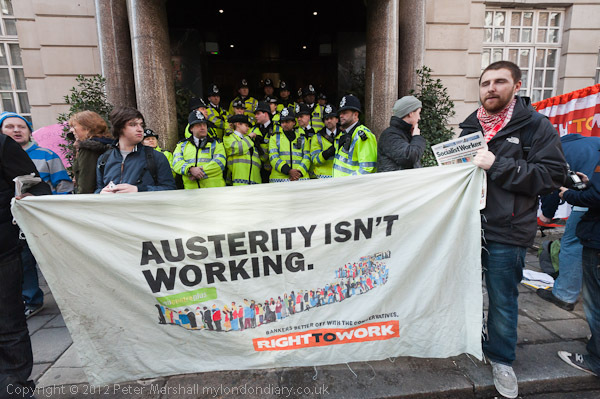 The protesters met outside BHS, and the protest started by hearing that since it had been organised, BHS had decided to stop participating, so they were off to protest elsewhere. The instruction, to protesters (and of course also photographers and police) was to follow the two flags to the next destination. There followed something of a cat and mouse game along Oxford St, made a little easier to follow after the first protest outside Pizza Hut when a map was given out with some of those taking part in the scheme marked on it. Of course the flag carriers were sometimes used to deliberately mislead the police and in the rather confused events it wasn’t always possible to keep my eye on the key protesters, so I wasn’t always able to be in the right place at the right time, though I did rather better than the police. 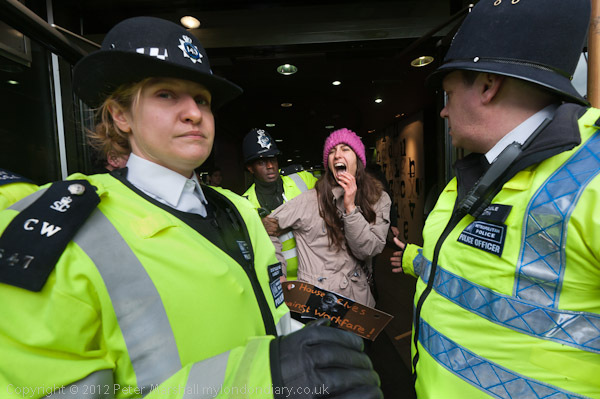 My favourite image from the protest – at 16mm I was very close! Sometimes of course you have to make a guess, and it can go wrong. I spent some time waiting outside a well-known charity that takes part in the scheme expecting the protesters to make at least a token protest there, but they had decided against it, and in doing so missed just a little of the action, and had to run to catch up when the group moved away to its next location. It’s also often difficult to know when it’s safe to leave, and I wanted to cover another event, and in this case my guess was correct, as I learnt later that the Holiday Inn was the final destination of the protest. 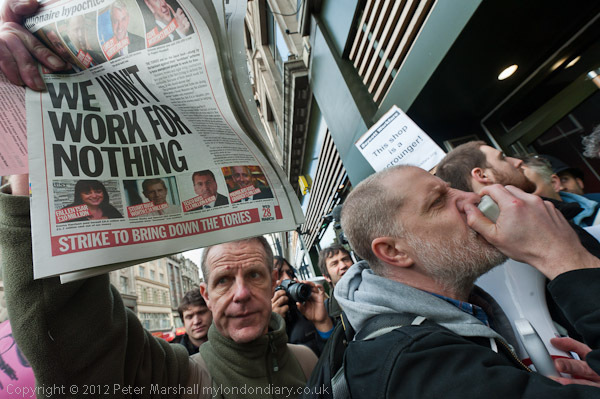 More pictures on My London Diary in Boycott Workfare – Oxford St. This entry was posted on Monday, March 19th, 2012 at 09:29 am and is filed under My Own Work, Photo Issues, Political Issues. You can follow any responses to this entry through the RSS 2.0 feed. You can leave a response, or trackback from your own site.